UXBRIDGE, Canada, Feb 25 2013 (IPS) - Green energy is the only way to bring billions of people out of energy poverty and prevent a climate disaster, a new study reveals. “Poverty eradication, sustainable development and the transition away from fossil fuel energy go hand in hand,” Rogelj told IPS. The U.N. Sustainable Energy for All (SE4All) initiative is ambitious, but brings a wide range of benefits including improvements in health, less air pollution and makes the all-important break from increasing fossil fuel energy use. The analysis shows the costs of SE4All is far less than the public subsidies the fossil fuel industry currently receives, he said. Nearly three billion people still use fire for cooking and heating. Of those, some 1.5 billion people have no access to electricity. For a billion more, their only access is to sporadic and unreliable electricity networks. Indoor air pollution from burning dung, charcoal, and wood for heating and cooking leads to nearly two million premature deaths of women and children every year, more than all the deaths from malaria and tuberculosis. Dirty fossil fuel energy is also a major health hazard in industrial countries, responsible for 50,000 to 100,000 premature deaths and 400 billion dollars in health costs a year in the U.S. alone, said Mark Jacobson an energy expert at Stanford University in California. “In the European Union, it is 350,000 premature deaths a year,” Jacobson told IPS. SE4All was first announced in 2009. “Energy interacts with all of the development challenges we face,” Kandeh Yumkella, director-general of the United Nations Industrial Development Organisation told IPS at the launch. Energy experts calculate that decentralised, off-grid technologies like wind, solar, geothermal and micro-hydro energy generation are the fastest and most cost effective solutions. Extending current electrical grids only makes economic sense to meet 15-20 percent of the need due to the high costs. SE4All is well under way now, with more than 50 developing countries working on national plans to achieve the three goals of universal access, increasing renewable energy, and doubling the rate of improvement in energy efficiency. Since 80 percent of human carbon dioxide emissions come from the global energy system, Rogelj and colleagues at the International Institute for Applied Systems Analysis in Laxenberg, Austria wanted to quantify the impact on the global climate. “Achieving the three SE4ALL objectives could put the world on a path towards global climate protection,” they conclude in their paper “The UN’s ‘Sustainable Energy for All’ initiative is compatible with a warming limit of 2 °C”. “Doing energy right will promote the Millennium Development Goals, such as poverty eradication and social empowerment, and at the same time kick-start the transition to a lower-carbon economy,” says IIASA researcher David McCollum, who also worked on the study. Even if the targets are achieved, explosive economic growth coupled with greater energy use will overwhelm the climate protection benefits of SE4All. “There is an explicit need for a global cap on emissions,” said Rogelj . Global carbon emissions were about 52 gigatonnes (billion metric tonnes) in 2012 and that means fossil fuel energy use must decline so emissions are about 41-47 Gt by 2020 to have a reasonable chance of keeping global warming below two degrees C.
The shift to green energy is under way. Every new megawatt added to the U.S. electricity supply in January came from renewables, and more than half of all new electricity generation in 2012 was also from renewables, not gas as often believed. Iceland has 81 percent renewable energy. Scotland has a mandate to achieve 100 percent renewable power supply by 2020. Denmark passed laws requiring that the whole energy supply – electricity, heating/cooling, and transportation – be met by renewable resources. Stanford’s Jackobson, among others, have proposed detailed plans on how to meet 100 percent of the world’s energy needs with green energy. Jacobson believes it could be done as soon as 2030. Costs for the SE4All plan are relatively modest at between 30 and 40 billion dollars a year, a fraction of the 523 billion dollars in subsides for dirty energy in 2011, according to the International Energy Agency. By 2030, 300 billion dollars a year will be needed to bring electricity into every home on the planet and prevent catastrophic climate change. Fossil fuel emission reductions will have to continue after 2030 and eventually decline to near zero in order to stay below two degrees C, said Rogelj. This is an interesting article – I had not seen it that way. I know that climate change will / is affecting the poor more than the wealthy, and that we need renewable energy. But I had not made the connection. Nicely done. Well done. Another alarmist ( is there an environmental journalist who isn’t ), promoting climate disaster. The empirical data supporting high climate sensitivity to CO2 is where? At the moment it’s low sensitivity all the way. CO2 is still increasing substantially, yet temperature is not tracking it. Green energy at the moment is not reliable. Germany learnt that the hard way, which is now planning to construct over 20 coal fired power stations. Poor populations will stay poor unless they have access to cheap electricity. Green energy is not cheap. This is very encouraging. Particularly when one remembers that as little as a decade ago, practically nothing was being done about renewables on the establishment level. Right on brother. Excellent research. This is great info and another reason for cautious optimism. Ontario’s FIT program (i’m producing enough for 3-4 households) should be continued and expanded not reduced. I just returned from an Ecovillage in NE Brazil. They are 100% off the grid with solar. Chad you are misinformed about climate sensitivity. There is plenty of data on this herehttp://www.skepticalscience.com/climate-sensitivity-advanced.htm You are wrong about Germany building over 20 new coal power plants. They are building some new ones while shutting down old one. What a load of environmentalist nonsense from start ” . 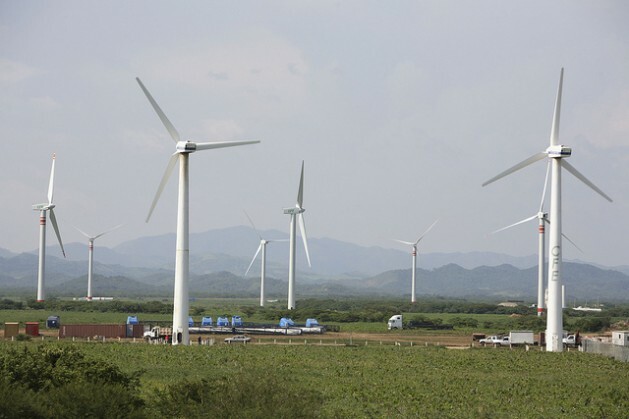 A wind park .. ” to finish ” .. Fossil fuel emission reductions will have to .. eventually decline to near zero in order to stay below two degrees C .. “. Those wind-powered electricity generating stations (and solar panels) are a waste of taxpayers’ hard-earned money. In the UK, Canada, USA, rest of Europe, etc. there is enough natural gas to keep our gas-fired power stations running for another 1000 years and let’s not forget all of that coal we still have at our disposal. As for global warming, the IPCC (and even the UK’s wet-office) recognises that we are heading into another little ice age. As usual Stephen you (like the IPCC’s Summary for Policy Makers) overlook those very important words “might” “maybe” could” and “perhaps” that are included in the peer-reviewed scientific literature. Please stop your scare-mongering and report facts for a change. Why aren’t you objecting to the $525 billion in subsidies to oil companies? Or the fact that burning oil and coal has a major impact on the health of hundreds of millions of people? Why aren’t you in favour of children breathing clean air? I don’t object to the use of fossil fuels or any subsidies that might be available to help extract them. Unlike those useless wind turbines and solar panels fossil fuels are relatively cheap and the most effective way of generating our electricity, heating our homes and powering economic growth which will help to improve the living standards of those millions of seriously deprived members of the global community. You and I are very lucky to be able to enjoy the benefits of living where we do. I wouldn’t want to have to return to the life style that I experienced as a child 70 years ago. Technologies exist that permit the use of fossil fuels while at the same time reducing the emission of pollutants to acceptable levels. Using natural gas is ideal because its major emissions are those essential life-supporting substances H2O and CO2 without which you and I would not be exchanging opinions. Thankfully there is enough natural gas in the ground to keep our power stations running for many centuries and the technology for its safe extraction is available (fracking shale). Before that is all used up there will be better alternatives but the time is not yet. I am not aware that there is an unavoidable serious health problem arising from the use of fossil fuels in developed economies such as you and I enjoy. If you know of one then please provide a link to reliable evidence so that I can check it out. In the past there was a serious problem here in the UK and I recall the reports here in the UK about the devastating smogs that Londoners suffered from before the use of coal for heating homes and offices was prohibited. It’s a process of continuous improvement thanks to the ingenuity of humankind so please, stop your scare-mongering and start making a useful contribution. Best regards, Pete Ridley (http://globalpoliticalshenanigans.blogspot.co.uk).